Fake and counterfeit products have always been on the rise. Unfortunately, it’s becoming more common in the computing world as well. A Fake Flash Test will help you test for Fake USBs and SD cards. You might already have purchased a USB or SSD card for a “great price” from eBay or Alibaba, but unfortunately that 32GB USB flash drive turned out to be only 2GB! This is becoming ever more common, and we’ve been caught a few times ourselves. With this guide, you’ll learn how to avoid fake USB and SD cards (or any other flash storage media for that matter), how to test your USB, and why this happens! What is a Fake Flash Drive? A fake flash drive is one that is advertised as having a much larger storage capacity than is actually possible. For example, your 32GB USD card might only be able to hold 4GB of data, or your 16GB microSD card only being able to hold 2GB. These devices often come from the far east, but you can find them everywhere, and usually cost a lot less than the real versions! Many people don’t even realise as they just buy a large capacity drive due to the “bigger is better mentality”. Unfortunately, it can cause issues for a lot of people, and it helps to determine whether it is actually a fake flash drive or if it’s just a corruption issue that can be fixed. Fake USB Flash drives come in two formats. Courtesy goes to RMPremp for a great writeup of these. Flash and SD cards tend to be formatted as FAT32. In FAT32 formatting the directory structure is located in the first few MBs of the memory, with the main data going above it. Understandably, if the base memory is destroyed or corrupt you’ll lose access to your data. (Though it is recoverable). The two types of fake flash drives are as follows. A Type A device will appear to have saved all of your files. When you check in your file explorer, it will seem to look fine. Unfortunately, after the 2GB point, all data will be corrupt and non-existant. A Type B device will show the fake storage capability, but you’ll only be able to put the amount of data equal to the true memory size of the flash drive onto it. Once you move past this point, you’ll start corrupting the flash drive. So now that you know what fake flash drives are, why they exist, and how they work, it’s time to get into testing them. A quick test you can do is copy a large file (10-100MB) onto the USB flash disk until it fills up and you can no longer access it. You can calculate the number of files you would need if it isn’t a fake flash disk, and see if it matches. FakeFlashTest by RMPrepUSB is probably the quickest and easiest tools to use. It verifies the real capacity of your flash device quickly and efficiently. FakeFlashTest will delete all the data on your drive (for the quick test anyway), so make sure you’ve removed all your important files from it. 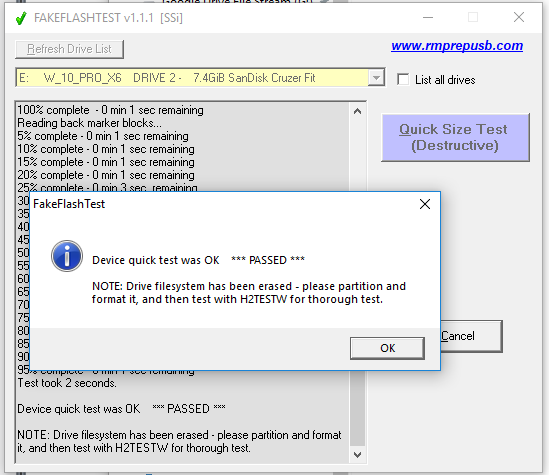 As FakeFlashTest recommends, you will also need to repartition and format your USB drive after testing it. You can do this by following these instructions. 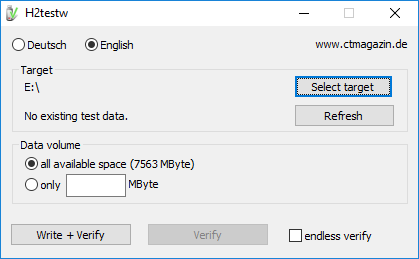 The Test Empty Space (Slow) option, will copy 200MB files onto the USB stick. Therefore, it’s similar to doing the quick test – just automated. RMPrepUSB is the more advanced version of FakeFlashTest. It also comes in a portable format. Therefore, you can check your USB disk without having to install any bulky software. It has a lot of options for different tests. As a nice little bonus, RMPrepUSB also has a built in speed testing option. However, as this is not it’s main functionality, we’re not sure how reliable this option is. H2testw is similar to the other tools, and it works by filling the whole USB with random data and then checks the integrity of the data. This means that with large USB sticks, the test will take a long time to run. On the whole H2testw is a very thorough tester, but unless you really need a lot of checks, you should avoid it as it takes a long time to run. ChipGenius doesn’t really test the capacitity/ ability for your flash device storage. Instead, it reads the chip data and compares that to a database. By checking the chip data, you can tell whether it is actually the make/model that you think it is. Understandably, if the branding is fake, the rest is likely to be as well. Though in some cases, you can have a fake branding, with the stated capacity, and in this case, it’s likely that the performance will be off. CheckFlash or ChkFlash as it’s more commonly referred to is another tool for checking for fake USB flash drives. ChkFlash keeps reading and writing data to your device and continuously checking for errors. Unlike with the other tools, you can set up multiple runs, so that it looks for errors multiple times, in case the initial run missed it. Here are a few bonus points to help you examine your USB / SD drive for faults and fakes. Original flash memory drives, tend to have much better read/ write speeds, especially from high end manufacturers such as SanDisk and Samsung. 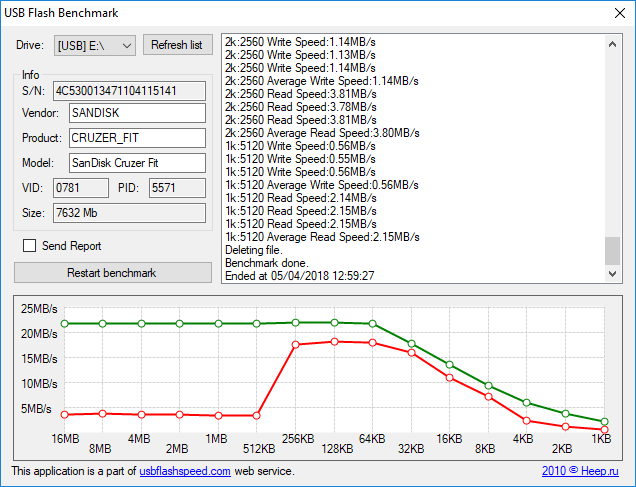 You can use USBFlashSpeed to check the speed of your USB stick. However, when testing, also make sure you take other factors into consideration e.g. formatting, USB 2.0 or USB 3.0, the overall performance of the PC, etc. as these can all affect the behavior of the drive. All of the above, are fantastic for monitoring and checking existing flash drives. However, if you haven’t purchased the device yet, it is still possible to spot fakes. If you go on to YouTube, there are plenty of videos that outline how to spot fakes and copies of high-end USB and SD brands. So there you, that’s how you can check if you have a fake USB flash drive. Hopefully, you’ll be able to spot fakes before purchase, but it’s also worth checking after the fact. If you have any feedback or comments then do let us know in the comments.